Analytic predictive archaeological models can have great utility for state Departments of Transportation, but it is difficult to model the likelihood of prehistoric settlement using geographical proxy predictor variables because of the complexity of how settlement choices were actually made, and the complex interaction between these variables using GIS. In many cases classic statistical modeling approaches require too much data to be useful. This research reports on a preliminary predictive model that combines Spatial Analyst and fuzzy logic modeling to capture expert archaeological knowledge and convert this into predictive surface. A test area was defined in Woodford County, KY and five influencing factors were defined and calculated using ArcMap. Locations were sampled and probabilities estimated using both small and large group structured processes from a range of archeologists that fed an iterative fuzzy logic induction process. An output probability function was generated to create a predictive decision support layer. 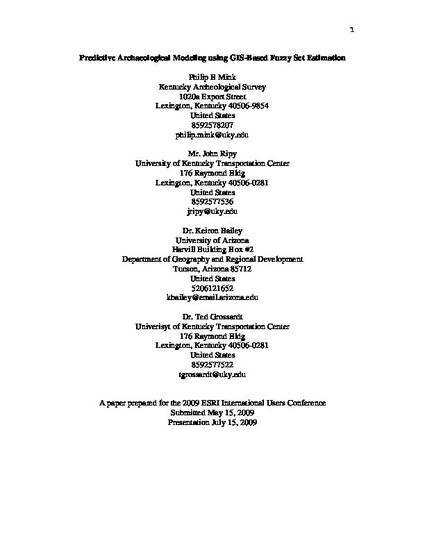 Published in the 2009 Proceedings of ESRI Users Conference, Paper 1495.